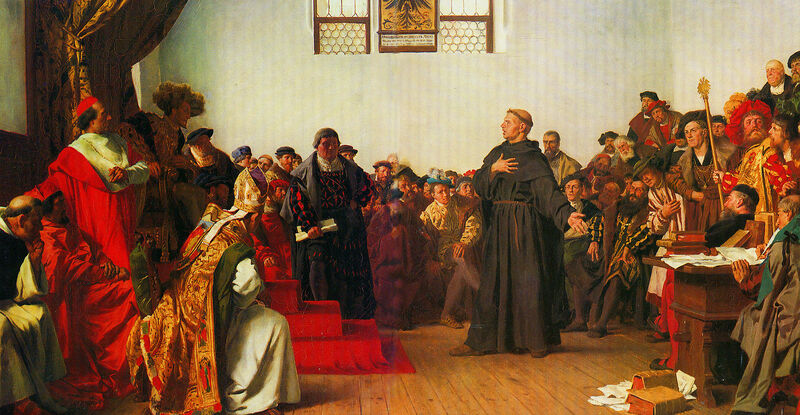 In 1521, Martin Luther stood before Emperor Charles V, the Holy Roman Emperor, at the Diet of Worms. Luther’s life and the future of the Reformation were on the line. I know that sounds like a bad dream – a diet of worms. The word “Diet” meant “an imperial assembly” in the historic sense, and “Worms” was the leading city in Germany where the meeting was held. Now condemned, an order went out for his immediate arrest and imprisonment. In the cover of night his friends whisked him away to the Wartburg, a castle high in the hills of Germany. There he lived in seclusion for 9 months with nothing to do, no place to preach, and no friends to turn to. The word quickly spread among his supporters that he was dead. While at the Wartburg, Luther disguised himself as a knight, growing a beard, and sported a more fashionable hair style and clothing. Alone, and with nothing but time on his hands, Luther gave himself to writing. Soon he began the mammoth task of translating the New Testament into German. In just 10 weeks it was completed. Up to this point the Scripture was kept from the common people, imprisoned in Latin. With the new invention of the Gutenburg printing press, thousands of copies were released to the masses. For the first time the German people could read the Bible in their language. Luther accomplished more with his pen in 9 months than many do in a lifetime. Where do you feel stuck today? Where are you lacking resources? Are you asking yourself, “When will the breakthrough come?” Are you hold up, feeling as if your hands are tied? Instead of asking why and when, begin asking the Lord what. What are you teaching me? What do you want to do in my life during this season? Often, when we can’t do a thing, God starts to do his thing through us. When we feel trapped God’s power begins to break out. Remember, God never wastes a wilderness. He has a purpose in it all. So, let’s not give way to complaining, moaning, or groaning. Let’s set our hearts to praise him in every circumstance and situation for this is the will of God. When no one else is watching, God is watching over us.